Utilities Product Engineer: Join Esri’s development team and create a framework for building solutions in the utilities industry. 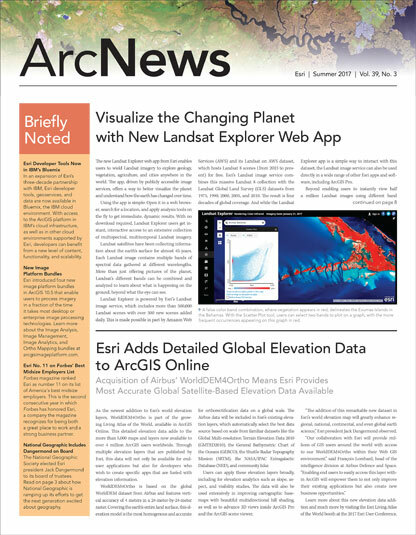 Influence ArcGIS product design, functionality, and usability. Technical Product Manager/Evangelist—Scripting: Inspire Esri’s developer community while driving the product vision and technical road map. Focusing on Python, the scripting language used across the ArcGIS platform, you will provide both pre- and postsales support. Account Executives and Account Managers—Retail, Manufacturing, and Electric and Gas: Work with an account team to sell and promote the adoption of Esri’s ArcGIS platform among organizations that work in these industries. Solution Engineers—Retail and Manufacturing: Define and deliver strategies to address users’ business challenges and clarify how GIS generates value for retail and manufacturing companies. Global Marketing Manager: Be Esri’s global brand advocate and drive international growth by extending marketing programs through the Esri Global Distributor network. Partner Marketing Manager: Work with Esri’s most strategic partners to ensure that these relationships are effective at propelling the growth of Esri’s brand worldwide.